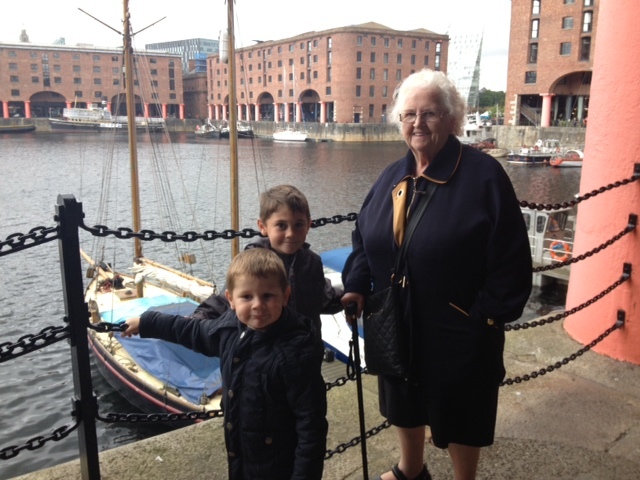 Yesterday I took my grandma and the boys to Liverpool for the day. My grandad used to take us to Albert Docks when we were children and Gran wanted to go back there to see what it’s like now. We managed to park right by the water (car parking charges aren’t too bad – we paid £6 for just over 4 hours) and wandered around the dock. Mostly filled with shops and restaurants, you can sit and look out over the dock whilst having lunch – it’s very pretty. The highlight of our day though was the Maritime Museum. Of course there were several different types of boat on the dock, including a couple of ‘pirate ships’ and these interested the boys so we headed inside to the museum. I figured it would kill an hour and they might get something educational out of it. We had our first photo opportunity before we even went into the museum. The anchor from HMS Conway, a Merchant Navy training ship which was moored in Liverpool for more than 80 years. We spent two and a half hours in the museum! There was so much more we could have looked at too but time was against us by then. Here’s a little insight into what’s beyond those revolving doors … The Maritime Museum shares its home with the International Slavery Museum. The former is on the first floor, so that’s where we headed. The museum is much bigger than I expected it to be and positively brimming with interesting facts about life at sea. 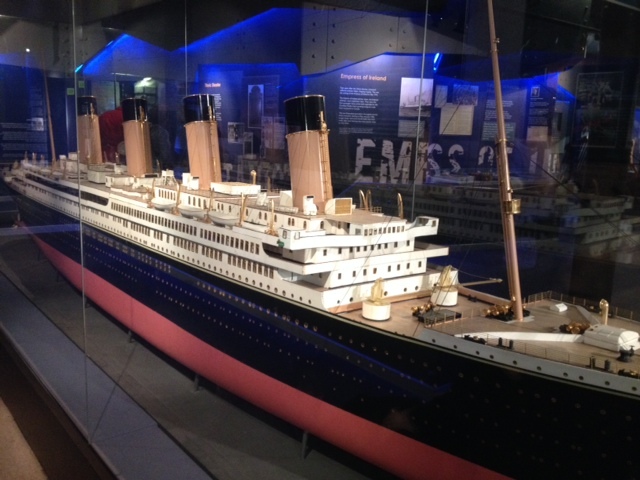 One very large section of the museum is dedicated to three ships: Titanic, Lusitania and the forgotten Empress. 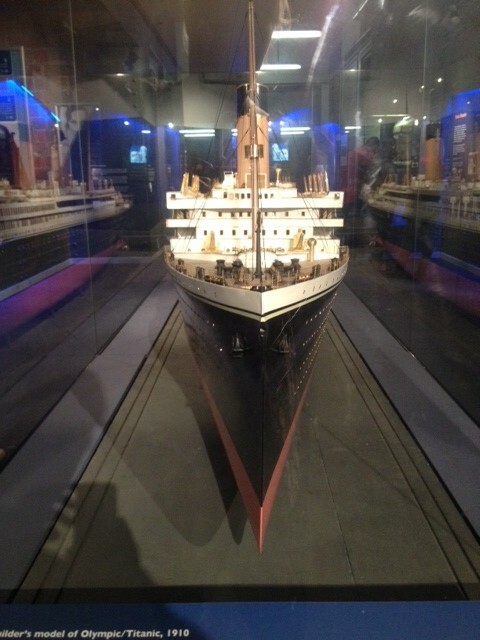 A model of the ill-fated Titanic, made at the same time and in the same place as the ship itself. Badger had a never-ending stream of questions about this model of Titanic/Olympic and about the story of the Titanic. ‘Did all the people on the ship die?’ ‘How did they get off the ship?’ ‘Why did it sink?’ ‘How come they didn’t see the iceberg?’ ‘How many people survived?’ It was lovely to see him so animated and enthusiastic about a topic and we talked about it for the rest of the day. When daddy got home from worked we talked about it some more! The best thing about the Titanic questions from Badger was that there was someone to answer them apart from me – an expert! 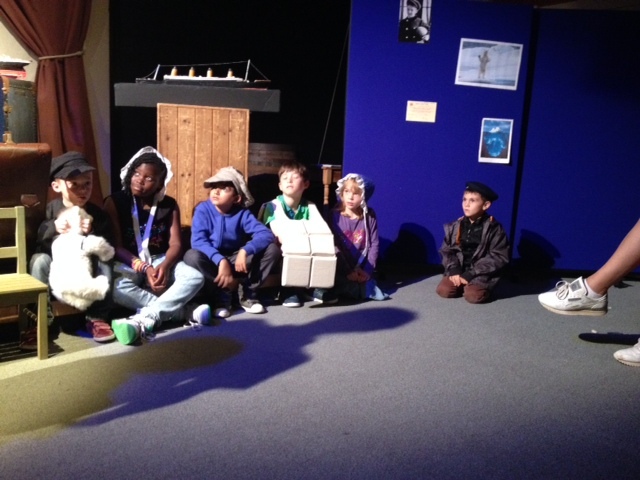 In ‘Learning Zone 1’ a very lovely member of the museum staff was telling the children the story of the Titanic. She wasn’t telling the story we know – complete with Kate & Leo – she told us a story that had been written by a real survivor from Titanic for her son, Douglas. Some of the children listening to the tale of adventure were invited up onto the stage to dress up as characters from the story and really take part in the story. We joined the story a few minutes after it had started and the boys went to sit on the floor near the front. I could tell that Badger was itching to be asked up to join in with the story, so it was little surprise when he ended up as Captain Badger! From left to right: Douglas – the main character, his mum, his dad, a boy in a life jacket, Douglas’ grandma and Captain Badger! 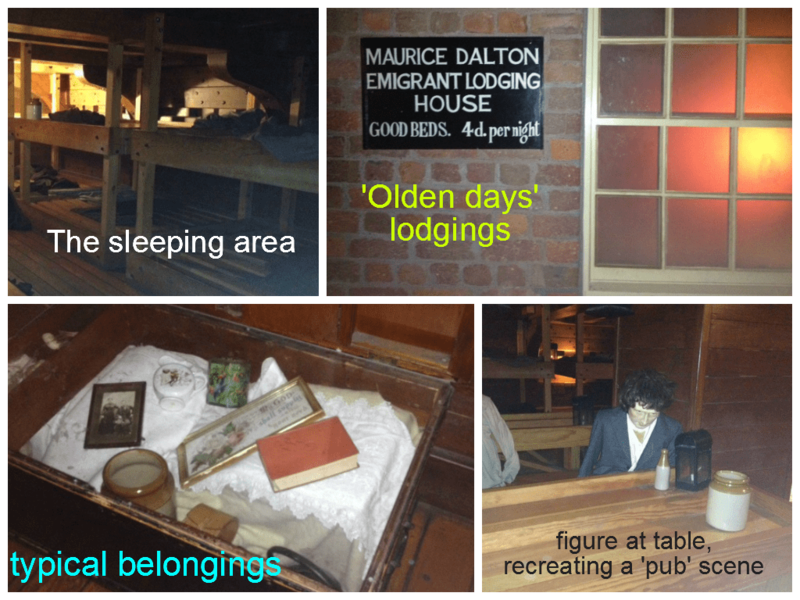 Another highlight is the wonderful way the people at the Maritime Museum have recreated the inside of a ship in their section about emigration. left Europe to find a better life? This is one of many, many facts I learned yesterday. Forty million people leaving Europe over 100 years. It got me wondering why they left, where they went to, how they got there … I find it fascinating! 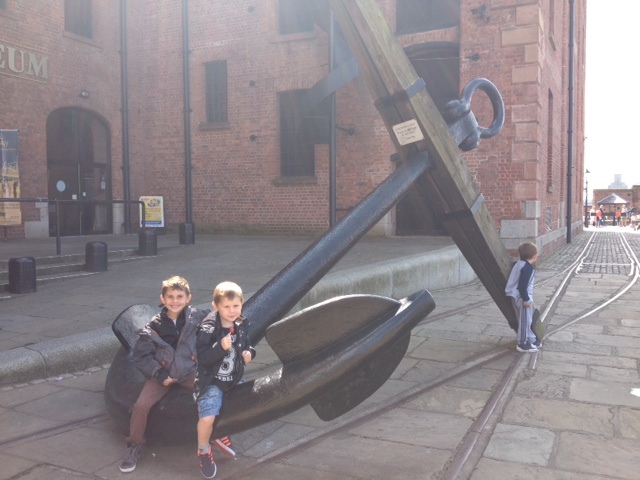 The boys enjoyed walking through a ‘real ship’ … There is so much more to see at the Maritime Museum and I will definitely take the boys back so we can spend a whole day there. There’s another learning zone that we didn’t get to see, a section about customs and excise, a section about art and the sea – and LOTS more! Linking up to Red Rose Mummy’s ‘What’s Happened? What’s Hapenning?’ Linky, where you can get inspiration and learn about new places to go! Jenny it was really fantastic and I was sad that we had to leave because they were closing! We will definitely go back. I’m keen to tap into that enthusiasm Louis showed and see him really enjoy himself! Ah, you’ve visited what is basically my second home in Liverpool! Glad you enjoyed the museum. I’ve been there a couple of times now and always love it You’ve got some great photos there too. Thanks for joining in with #FamilyFriday. Hope to see you again next week. I love the Maritime Museum. I’ve been there lots with my two children and they always find lots to do! We like the Customs and Excise post, you get to use a simulator to control an excise ship chasing smugglers. Liverpool has so much for children! Have you tried the Walker Art Gallery at the top end of town? That’s a firm favourite with us too.